Every cycle tourer needs a decent set of panniers, buy crap ones and you will suffer for the whole of your trip – it’s the one thing you do not want to scrimp on. 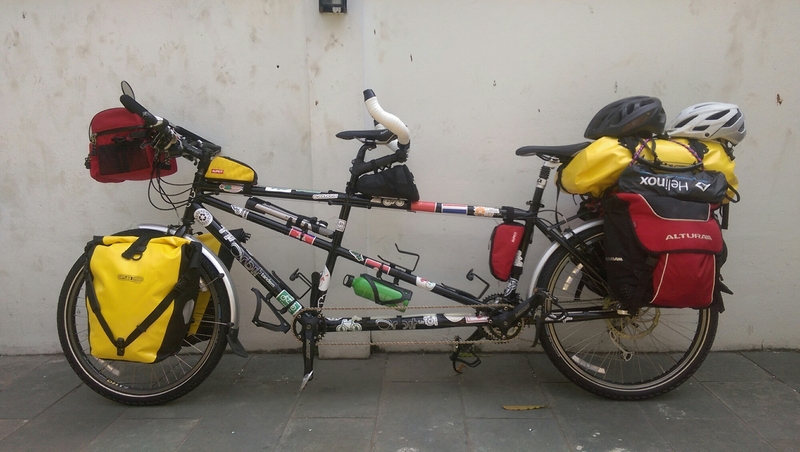 Because we are on a tandem without a trailer we were forced to make some alternative decisions regarding our panniers. We needed as much as space as possible in our bags and Ortlieb are limited in this respect (the largest back panniers we could find are 40L). Consequently we ended up buying a mixture of four brands of bag for our bike – Altura Orkney, Ortlieb, Alpkit and Arkel. After five months on the road and having experienced a range of climates and weather conditions we’re in a good position to compare them side by side. The Canadian Arkel company have a good reputation online for making a high quality product but they are notorious for being one of the most expensive. We opted for Arkel because their large handlebar bag is the biggest volume waterproof product we could find and at over £120 it was pricey. 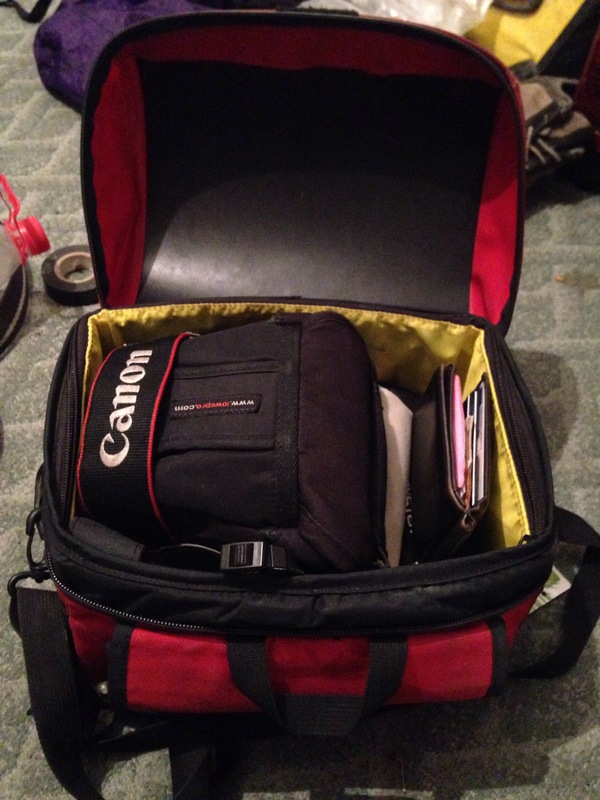 It hasn’t disappointed though and you certainly can fit a huge amount of stuff in it. It has a lot of nice small features which we really like too. There is a large front pocket which although isn’t completely waterproof is great for keeping small things you need to access quickly. There are also two mesh pockets on the side which are super useful for stuffing everything from rubbish packets to keeping gaffer tape. The bag has zips which we think are far superior to the Ortlieb clip fastening – mainly because it allows the bag to be padlocked shut. This is incredibly useful for when you need to leave the bag containing all your valuable stuff in a shared dorm, sleeper train or left baggage department. The mounting system for the bag is very effective and strong and it’s easy to clip the bag on and off. The bag comes with a waterproof map case which we never really used and the inside bag is removable so you can wash it. The bag is roomy! It’s actually crazy how much stuff you can fit in there with plenty of room to spare. See our Fully Loaded page to see what we keep in ours. The top of the bag is domed which means you can stuff it full with your gloves, snood and snacks on top of all your valuables if you need during the day. It’s 100% waterproof, has kept its shape well and we would buy it again in a second. We were slightly weary about buying this brand as we hadn’t read much stuff about them online. However, we found these panniers online and their super size (56 L) won us over into buying them. They are beasts and we can carry a wonderful amount of gear in them but they have impressed us in every other way since too. We are so glad we bought these rather than another set of backroller Ortliebs. First things first – they are completely watertight. The inside waterproof insert also comes away which is great when you want to clean or empty the inside of your food bag. They have front pockets (these are not watertight) which have useful mesh and Velcro compartments – something Ortlieb panniers, in our opinion, really lack. The mounting system is really strong and far superior to the flimsy Ortlieb clips – more complaining about these to come… The bags can tend to slide up and down a bit on our rack if we’re on a bumpy road but they have never broken or come off. Unlike the triangular shaped Ortlieb panniers these bags are more square which means they are far more effective for storing bulkier items such as your cooking gear and the flip clipped top is adjustable to allow you to really stuff the bags with extra food or clothes if you need. 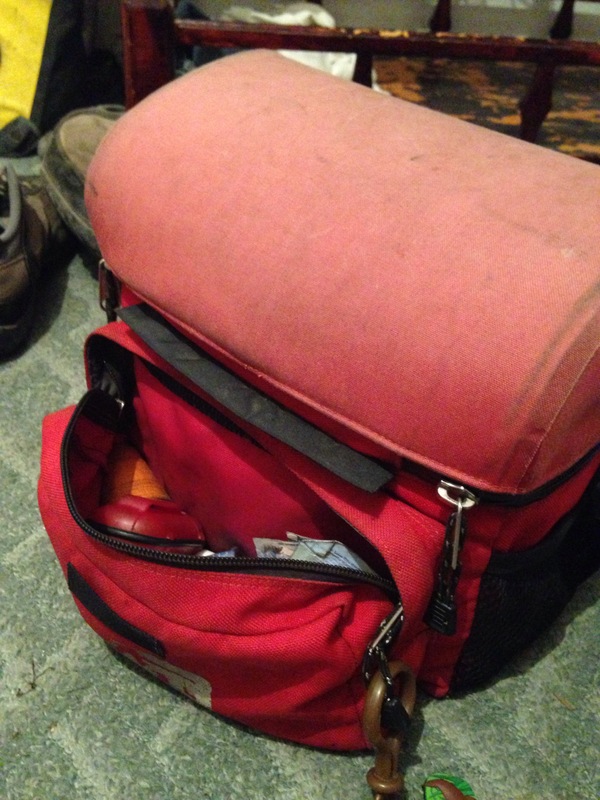 The bags are incredibly durable and have had a fare number of knocks, scrapes and falls. The only time they have failed us over the Ortlieb was when ants got inside and pincered holes in the inside bag to get to our food. Our Ortliebs have always remained insect free due to their roll down, dry-bag fastenings and thick plastic material. Overall they have been a great buy for us and if you are in need of a larger set of panniers we would highly recommend them. Our Ortlieb panniers are saved to carry our clothes but we use their largest back rollers on our front rack instead of the back. 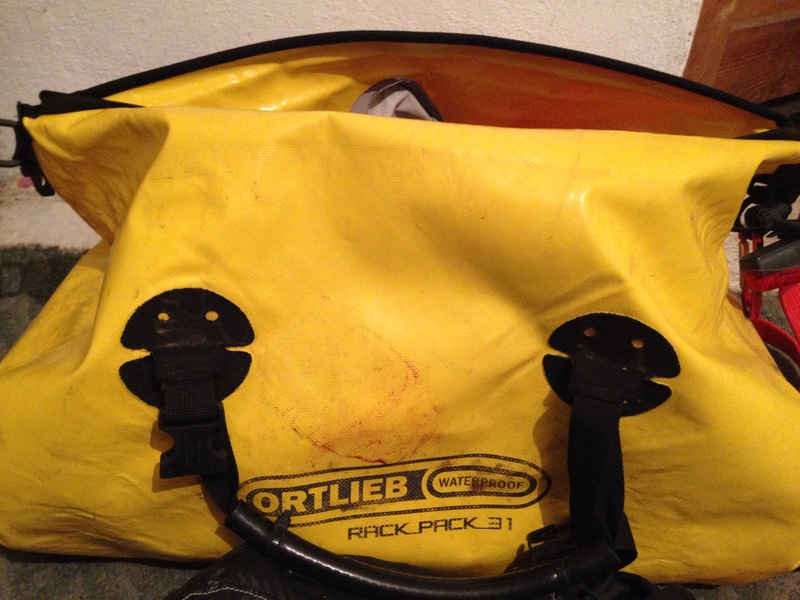 The Ortlieb panniers are great (completely waterproof, easy to clean and durable) but they fall down on one feature which makes them incredibly frustrating to use. The mounting system just isn’t up to the job of coping with a heavily weighted pannier on bumpy roads. This problem is probably over emphasised with us because we carry large panniers on our front rack but we’re not the only tourer who has complained about this problem. Once under enough force the bolts which are made of plastic simply pop out of the plastic bar mounts at the back of the bag. In doing so they ruin the threads which means you can’t easily screw them back in. We have heard of tourers obsessively checking and screwing back up their bolts after every night to ensure they don’t pop out. We have to reinforce our bags to the rack with rope to minimise them bumping around on the rack. This is time consuming and means we can’t easily clip and un-clip our panniers taking advantage of the ‘user friendly’ Ortlieb mounting system. Even after this both bags have broken. 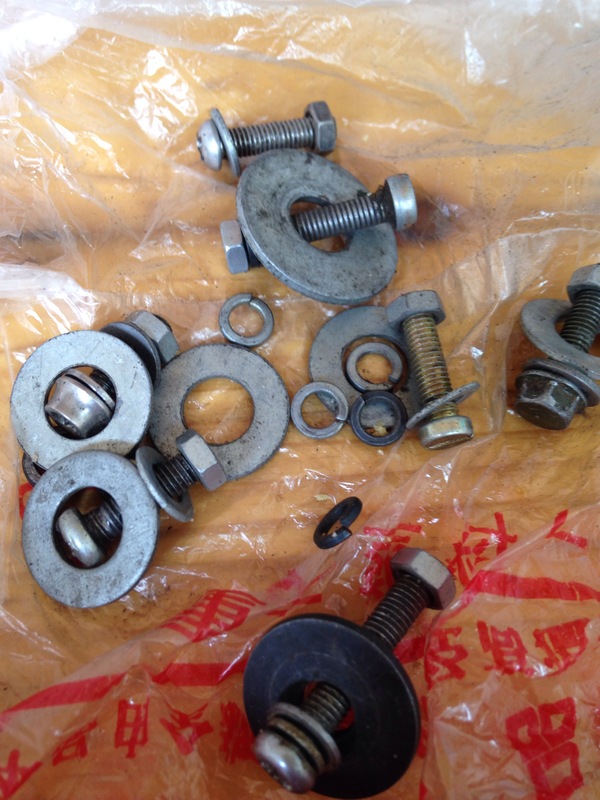 We met a tourer in China who had simply replaced all her plastic bolts, nuts and washers with metal ones. We ended up doing the same. 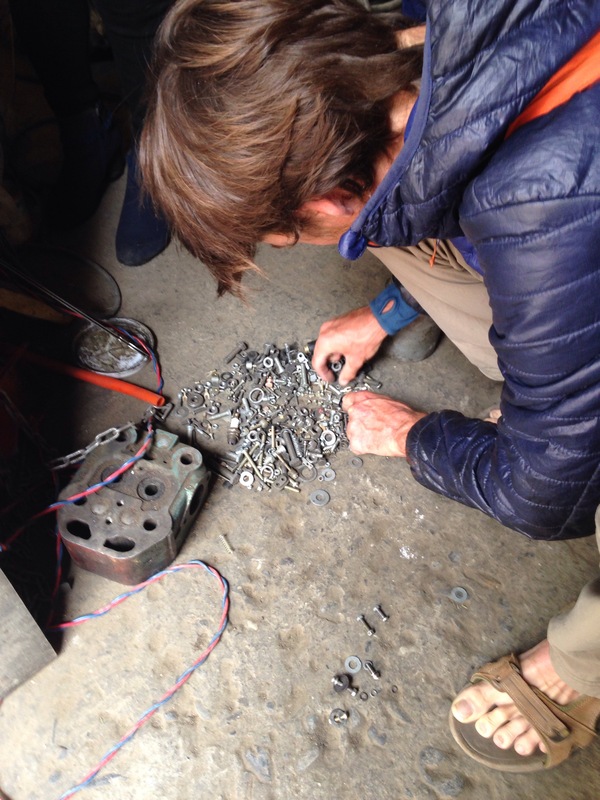 Here is Paddy in a local garage searching for the right width bolts and super large washers for the insides of the bags. I wrote to complain to Ortlieb and I was very impressed with their customer service. They got back to us within 24 hours and without question offered to send spare parts to us in China. The package arrived 7 days later but we haven’t used the parts because they sent us the same crappy plastic ones. The fact is, Ortlieb panniers are fine for those cyclists who are taking short tours on nice smooth roads or commuting to and from work but in our experience they don’t hold up well on long bumpy tours unless you make some of your own adjustments. 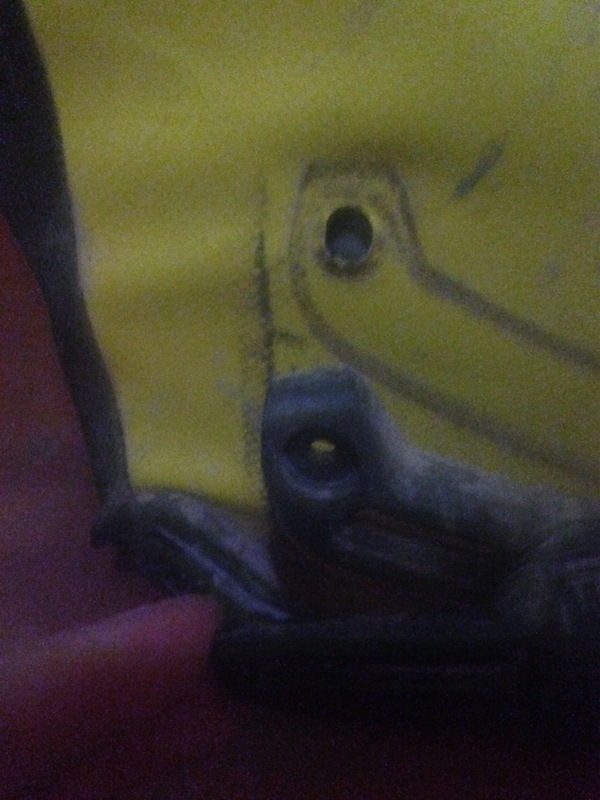 If you have bought Ortlieb panniers just make sure you replace all the bolts and nuts with metal ones and buy extra large washers for the insides. I can’t fault the rack bag. It does everything we need it to. 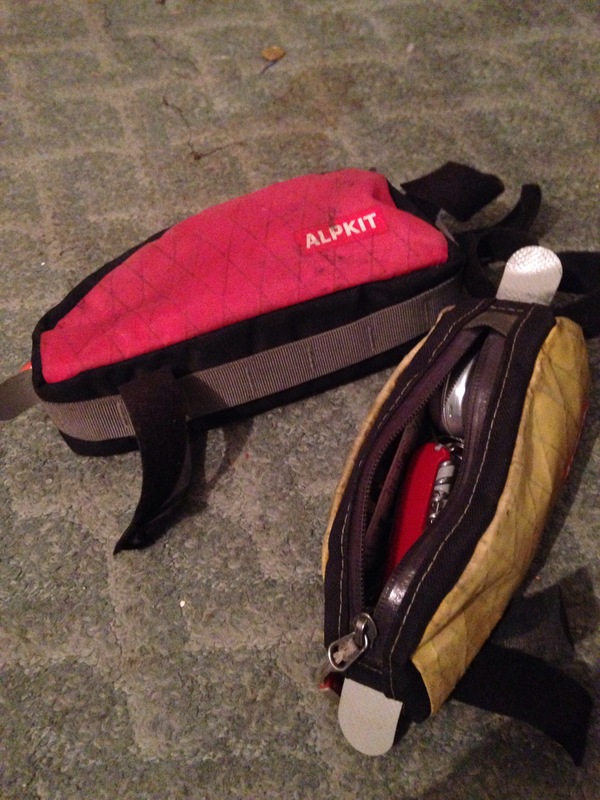 Alpkit are known as a good outdoor gear supplier. They make some good stuff and we’re always happy with the gear we get from them. Our two frame bags are durable and are great for keeping all those small items that you need to access quickly. They are showerproof not waterproof.